One Sentence Exhibition is a brilliant idea I wish I thought of it. This is a web-based project that has been started in May by the Kadist Foundation in Paris which invites approximatively every month a curator to write a sentence. Each word in the sentence refers to an image, webpage, video or text among others. 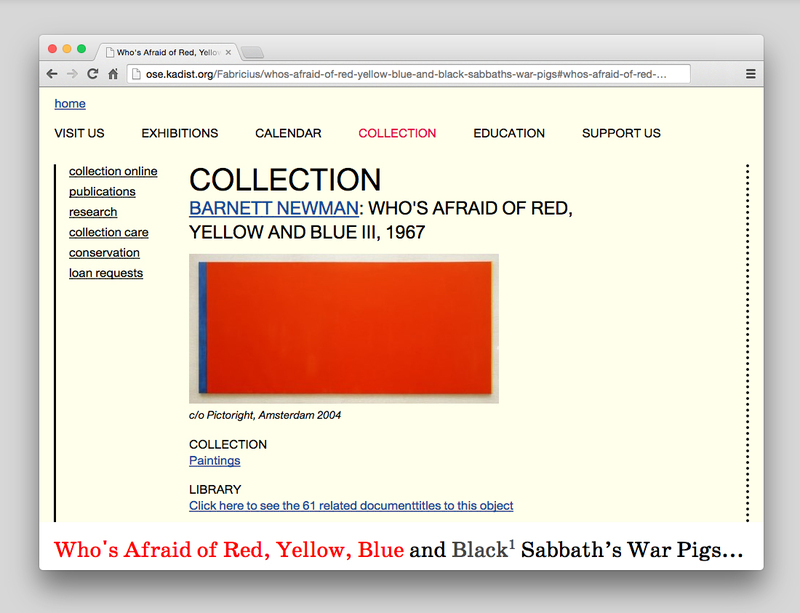 For the month of October (which is actually the current exhibition), Danish curator and writer JACOB FABRICIUS proposes the hyperlinked sentence Who’s Afraid of Red, Yellow, Blue and Black Sabbath’s War Pigs. The month of November will be dedicated to the sentence of CHEN TAMIR – curator at the Center for Contemporary Art Tel Aviv and curatorial associate at Artis – and curatorial research colleague TALIA HEIMAN. The only frustrating detail is that it’s impossible to browse the previous sentences.